I’ve been on an emotional rollercoaster for more than two months now. What the brain surgeon said in the din of the hospital’s florescent lighting matched the black and white online entry, exactly: best possible scenario, we only have two years. Though you may try, like I did, there is no manual that will help you fully intellectualize how to deal with your mother’s brain cancer diagnosis and impending demise. Not even rereading Elizabeth Kübler–Ross’ five stages of grief can stave off the reality of being thrust on an emotionally messy rollercoaster. I’d like to say that my eight-year love affair with yoga saved me, but I had to fight my way back from the edge, warrior style. On my yoga mat, right after “the diagnosis,” I remember thinking how odd it was that there was no discomfort whatsoever in either of my hips as I lounged lazily in pigeon pose thinking, “oh, I’ve got this handled.” Meanwhile, out in the world, I couldn’t seem to shake myself awake. I will never forget how I sat dazed during a twelve-hour train ride to a speaking engagement in Rochester barely able to concentrate on what I’d say. Still, somehow during this initial phase of denial, I landed the engagement with poise, grace and dignity. As the days ticked by, however, things changed drastically. I noticed people pulling away even though I was attempting to keep my social life intact while also helping to care for my mother. One dark and terrifying night I looked into the dazzlingly beautiful abyss of the night sky, and I disassociated completely from a party happening just steps away as grief-stricken tears streamed silently down my face. That same night, things sped up again, and I watched myself become uncontrollably angry and lash out at another with a still somewhat detached amazement, “who is this beast I’ve become?” The word “cancer” does scare people away, but I was also making it worse through perfectly normal phases of grief. The rollercoaster outlined by Kübler–Ross had completely taken over and the lack of control I felt ultimately forced me back into my beginners mind. In other words, it wasn’t until I admitted, “I don’t have this” and “I’d better get it together” before I lose the focus I need to love and care for my mother in her final days without completely alienating myself even further from those around me that aren’t afraid of the word “cancer,” that things could stop spiraling out of control. If people need to go, let them go. Now, I’m back on my yoga mat and more present than ever before, and I’ve found that my inner world is stabilizing along with the world around me. My mother will die. This has not changed. However, I’ve realized and accepted: This is our new normal. All we have is today. All we have is this breath. All I need to do is breathe. 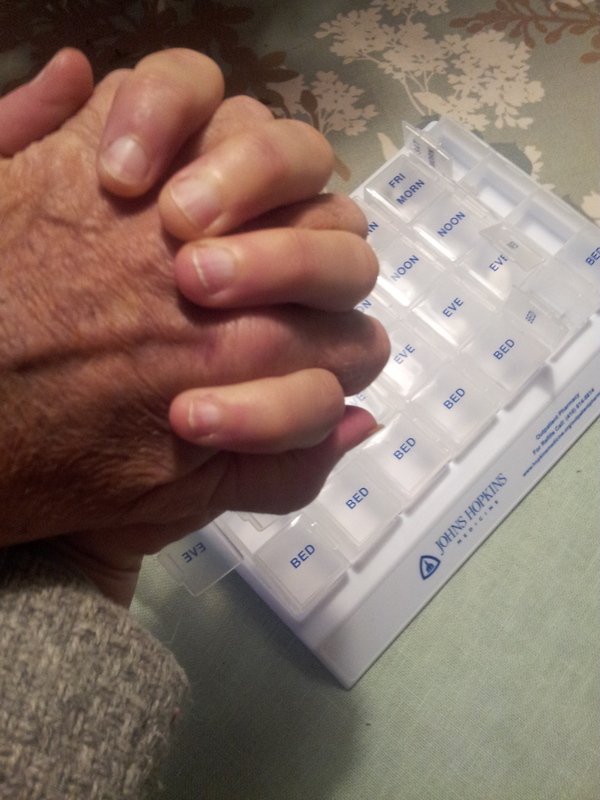 I write this with the memory of caring for my dying father heavy on my mind. It never leaves me, it’s there, silent, until it is not. I want to say that I admire your courage, your messiness, your dignity, your chaos, your honesty – why? Because those states of being are very real and intensified when our loved ones are gripped by life-altering diagnoses; and they certainly don’t manifest neatly at times. Cancer is indeed like a roller coaster, one too many of us have to ride without warning or preparation. Know that for those who are not able to be there for you, for those who cannot handle the world of cancer; there will be those who can support you without reservation, without questions, without fear. Lean on them, my dear Amy, and continue pursuing yoga and anything else that keeps you grounded. My heart feels your words deeply. « Rosewood. In the news. Again.